At Traditional Cooking School, we're all about empowering you to get your kids in the kitchen! And there's no better place to start than snack time. Maybe you're not quite ready to turn your kiddos loose with a knife or at the stove. That's ok! Here's a fun idea to keep your kids busy WHILE they make their own snack — no knives or heat involved. THIS easy summer snack is the perfect place to start! Our 3-year-old friend Alma came over for the afternoon to make this easy summer snack with us. She took her job very seriously and didn't even poke herself with the skewer. So, turn the kids loose with this great activity on a hot summer day when no one wants to be outdoors. Using a melon baller, scoop out balls of melon. Thread the melon balls onto the skewers, making fun patterns of your choice. Place finished skewers on a parchment-lined cookie sheet. Place in the freezer for 4 to 6 hours, or until solid. *Use any type of melon! We used watermelon and cantaloupe because those were available to us. Honeydew melons are great too, or use this as an opportunity to try some lesser-known melon varieties such as sprite melon, canary melon, or Korean melon! *The amount of melon you use will depend on how many kebabs your children want to make. For us, 1/4 of a medium-size watermelon and 1/2 of a cantaloupe were plenty. *Having a summer party in the near future? 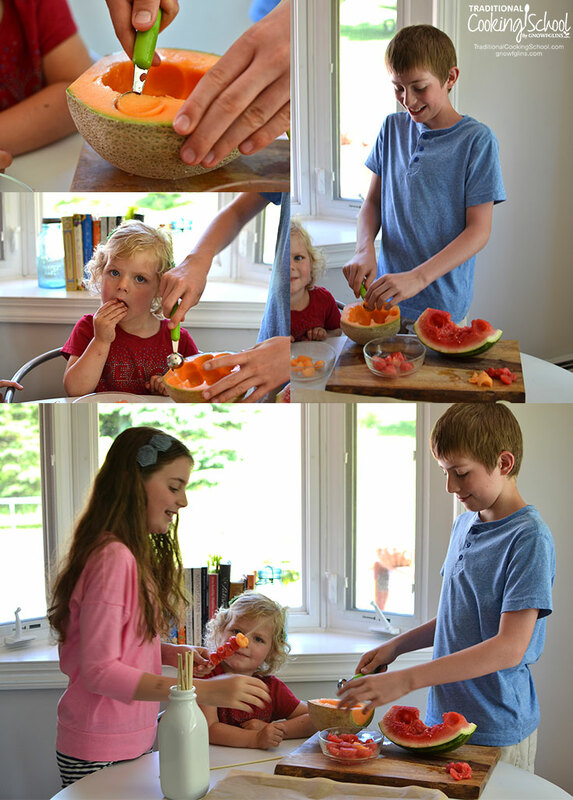 Give the kids the job of making this easy summer snack for their friends or party guests! Check out another of my other easy summer snacks for kids: Frozen Berry Kebabs! Want more Real Food Kids snacks? Be sure to snag your FREE guide: Real Food Kids Snacks! You know it's time for your kids to learn valuable kitchen skills, right? But you don't have a clue where to start. You don't want the hassle and mess of cooking with your kids. What if I told you that it's easier than you think? What if you had someone else teaching your kids alongside you, making sure you didn't miss a step? That's EXACTLY what our Real Food Kids eCourse does! Your kids will learn not only how to cook for themselves (and the rest of the family), but how to properly use kitchen knives, how to roll dough, how to follow a recipe and measure ingredients, how to use kitchen appliances, and MORE! This course will help you create your own family-focused kitchen that churns out amazing food, laughter, silly songs, and life-long healthy cooking skills. If that's what your family needs, check out our Real Food Kids eCourse — and before you know it, you will be able to trust your kids to use a knife or the stove! What are your favorite easy summer snacks for kids? 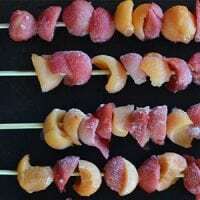 Would you like to try these Frozen Melon Kebabs? This post was featured in 24 Easy Summer Treats Kids Can Make Themselves, 47 Trim Healthy Mama E Meals & Snacks With Traditional Foods and 92 Nourishing Grill & Barbecue Dishes, Drinks, & Desserts.